The Nottingham East Midlands Airport, known nowadays as simply the East Midlands Airport, is located at Castle Donington, a town which is surrounded by the three major East Midlands cities of Derby, Leicester and Nottingham. This is a busy hub for both passenger and freight throughput, and serves the residents of five counties, namely South Yorkshire, Nottinghamshire, Derbyshire, Staffordshire and Leicestershire. Over four million travellers are now using this facility per annum. Owned by the Manchester Airports Group since 2001 and originally a Royal Air Force base, this complex took on its current form in the mid-1960s, when it was reconstructed and renamed the East Midlands Airport. Today, this is a modern, up-to-date facility, having had a large number of improvements since it became privately owned. Of interest, in the year of 2011, the facility was voted 'Best Airport of the Year' by Travel Magazine readers. Routes available here mainly serve Mediterranean holiday destinations, as well as some major European and British cities, with budget airlines being the main carriers. Ryanair, Jet2 and BMIbaby are represented, as are the charter companies of Thomas Cook and Thomson, which also serve routes to Sharm el Sheikh and Orlando. 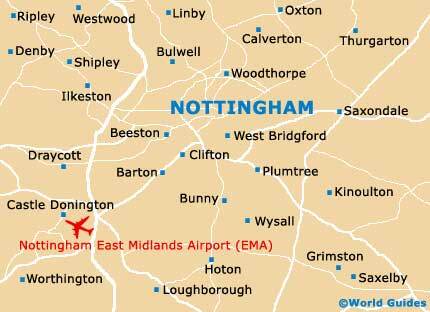 The Nottingham East Midlands Airport is situated on the outskirts of Castle Donington, some 18 miles / 29 km from Nottingham and even closer to Derby. The two cities, along with Leicester, all lie within a 20-mile / 30-km radius of the airport and are conveniently connected by motorways. The airport is located within minutes of the M1 and M42 motorways, giving easy and well-signposted access to all of the surrounding cities and towns. The drive into Nottingham takes around 30 minutes, while the drive to Derby will last some 25 minutes. Leicester can be accessed in around 35 minutes. Book your East Midlands Car Rental here. Skylink buses run from the Nottingham East Midlands Airport into Coalville, Loughborough, Leicester, Derby and Nottingham throughout the day, at intervals of 30 minutes to one hour. By bus, the journey to Nottingham takes around 30 to 45 minutes. The East Midlands Parkway Railway Station is situated just over 4 miles / 6 km from the airport. From here, passengers can catch trains to the surrounding cities of Nottingham, Leicester and Derby. Taxis can be booked in advance or on arrival at the official Arrow Cars desk, which is situated opposite Arrivals. Regulation baby and child seats are available upon request.